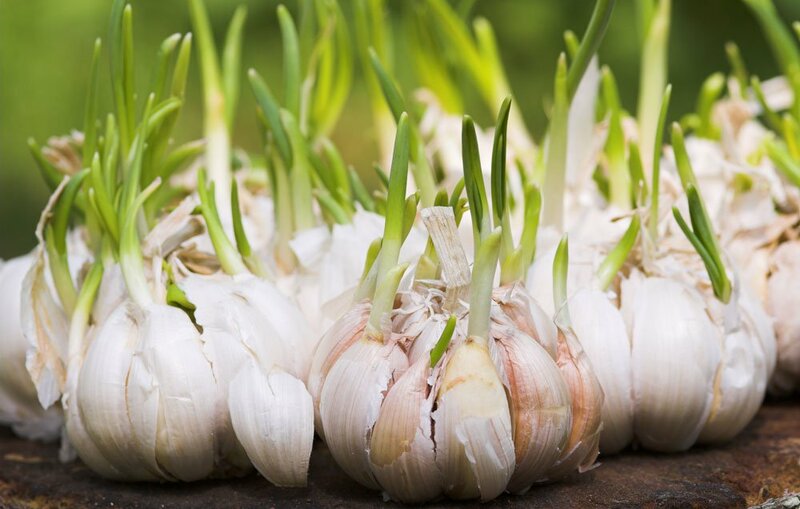 Growing garlic is pretty easy, and can save you a ton of money especially if you use a lot, but these 6 garlic growing tips (from the pros) will ensure that you get the BIGGEST, baddest garlic crop ever! These tips are taken straight from the most seasoned gardeners and will yield some beautiful, big garlic heads that will impress all of your gardener friends! Fall through spring is the best season for growing garlic. Garlic should optimally be planted in the fall because it will develop its roots quickly, and therefore will be well established once winter comes. As soon as the soil starts to warm up, they’ll quickly start growing and by the beginning of summer, you’ll be rewarded with a bountiful harvest. Every year, try to plant different varieties. Some really great varieties are Music and Bogatyr which are basically giant bulbs with a ton of flavor! But a word of warning: small and medium sized varieties store better than larger varieties, so choose varieties that go with your local climate! Large cloves provide abundant food reserves for growing garlic seedlings, so it’s always best to choose outer cloves. Be careful of very large cloves that can often split into two though, as they may grow two very tightly spaced twin plants which will produce lopsided bulbs. Garlic hates weeds and will not grow well if not properly mulched. Lay some straw mulch around your garlic crop in the winter to prevent weeds and keep them warm. Mulching will also help keep the nutrients in. Usually, garlic crops will not be affected too much by pests or diseases, but it CAN happen. Keep an eye out on soil borne diseases ( onion white rot), and onion root maggots which can appear out of nowhere. To keep this from happening, keep a close eye on your crop, and, if needed, place a row cover barrier. To store garlic bulbs, it’s very important that you remember NOT to wash the harvested bulbs. Washing them will discolor in storage. But it is a good idea to trim off roots and green leaves soon after harvest, which will quicken the drying process. So now that you know these 6 garlic growing tips from the pros, it’s time to roll up your sleeves and get to planting! 6 Garlic Growing Tips From the Pros was last modified: February 2nd, 2018 by Aniela M.
Very dynamic and valued tips. Thanks.